(Swift, Jonathan (1667-1745) and Tory Party), The Examiner. Or, Remarks upon Papers and Occurrences, London: John Morphew, 1710-1714, volumes I-VI, bound in contemporary tooled and spotted calf, each paper from vol. II no. 36 to vol. VI no. stamped with half penny tax stamp, folio, (hinges cracked, spine chipped and worn). 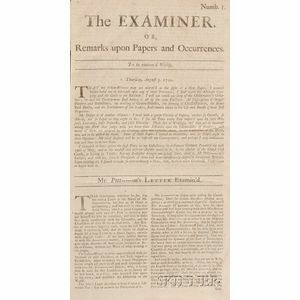 Note: After the formation of the Tory Ministry in 1710, The Examiner was published as a weekly periodical to fully expound their views under a united voice. 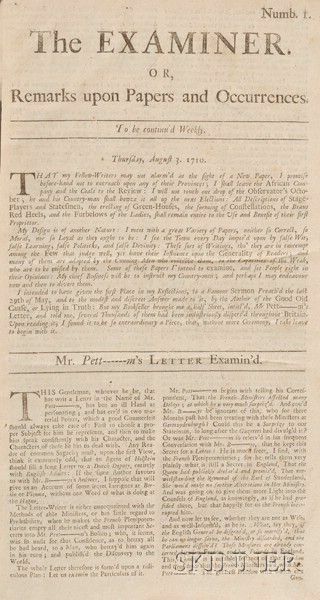 By November of 1710, Swift had become so committed to the cause that the entire weekly periodical came from his pen. Some of his best political insights and musings on current events came through this paper.